09 updates . . . The holidays have come and gone, and here we are , mid January, and I have not blogged. I have fallen off the blog ladder. 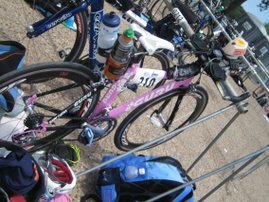 It's easy to blog when you are tracking and training for triathlons, but when you are just living your life and recovering from back surgery, it's hard to stay consistent. Then, there was my recent period of mourning. My beloved Ally died on New Year's eve. We were returning from a nice trip in Mexico when we got a call from my buddy Mike that Ally was lying on our living room floor, dead. He just walked in an she was lying there like she was sleeping, only she was dead. So of course, clearing customs, I was a complete mess. She apparently died that day, somewhere between the morning and noon hours, so when I got home that evening, she had not been dead that long. It was an awful night, with Rob and I taking her to the animal hospital to ensure she was refrigerated, then returning the next day to pick her up to take to our vet for a necropsy, or doggie autopsy. Ally was my constant in these last eight years. I have had so many life experiences, and she was always there. I loved her like a kid, so her sudden passing was really tough. If there is anything I can take comfort in knowing, it's that ally went peacefully. we later learned after checking out her organs that she had a big tumor in her heart. she was never in pain. her heart simply stopped. 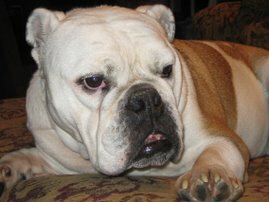 Ally also passed away on new year's eve, as if to leave before the new year and to close out 2008. Eerily symbolic to me. And the fact that she waited to die on the day we returned was also something. If she had died days earlier, no question we would have cut our vacation short. I picked up her ashes today. I plan to take them to atlanta and spread them at this creek where she used to run as a puppy. Love you Ally. I miss you dearly. . . . . Bionic Back . . . Last week also marked my one month anniversary of my mega back surgery. I met with my surgeon, who was very happy with what he saw. . . . 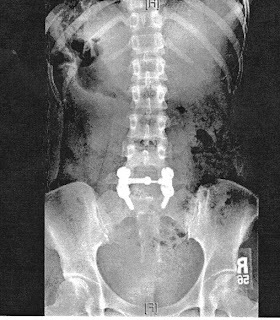 The bright part of that Xray is the actual titanium hardware in my lower back. Strange but true. .
.So how do I feel? Well, my left side is still pretty sore. I can walk with ease, but running for the time being is out of the question. Is it less painful than before? I cant tell right now because I am still sore, but I sure am recovering quickly. My doctor has cleared me to walk and ride my stationary bike, so that makes me happy. I can also do light weights, but of course I hate doing weights so i haven't even begun to do that!. It's still strange to me that my back is being held by rods and screws. The good news is that I'm not on pain medication any more. i might occasionally take one /half a vicoden if i'm feeling really sore, but that's rare.. .
.Yesterday I cheered on marathoners at the Houston marathon. How strange it was for me to be on the other side. I still loved it. I loved seeing friends running. I loved yelling out stranger's names. I loved seeing people smile, drink beer, look dejected, stop and walk, move quickly. We stood around mile 21 where we waited for our good friend Joe to come by. He did. In truth, Joe rolls like me when it comes to marathons. He doesn't train, puts in a long run a week before the race and just gets out there.
. Ironically, Joe and I ran the last 13 miles of last year's marathon together. albeit slowly. We just happened to bump into each other and used all the mindless support we could get. Last year I didn't train either. I think I did one long run as well.
. Anyhoo, the point is, marathons are still cool to me. I can't wait to get back into all this and run houston next year. woo hoo!
. Congrats to the marathoners! It was another gorgeous day! Besides the tragedy of Ally, life is good. Grad school starts back up tomorrow. I am taking 3 classes, doing one independent study on death row appeals and advocacy, and I will continue my internship at baylor. I'm not training for triathlons because I can't. But that's okay. Other good things are happening, and I am happy.
. "...love knows not its own depth until the hour of separation." . One week ago, just around the time I am writing this, I was being wheeled into surgery. I don't remember being knocked out. The last thing I remember was being in the pre op area, having a needle with some white looking stuff I was told was valium injected into me. Apparently, that valium was supposed to make me calm. It made me pass out a tad early, but that's alright. The sooner, the better. So what's the prognosis today? Progress, but slow. Last night I managed to walk a whole mile at the gym. The gym has an indoor track that measures 1/8 a mile. It took me a whole 30 minutes! I have to walk slowly, because my back still hurts, and with every step, I can feel some twinge or pang. Oh the joys of post back surgery. One mile in 30 minutes? How crazy does that sound? I have spent the day indoors. I am easing off on the cleaning and house chores because it probably wasn't a great idea. Last night, we went to bed late because we stayed up watching True Blood, a new HBO series about modern day vampires who have "come out of the coffin" and are adapting to mainstream America now that a japanese made synthetic blood is available. Ha! The show is addicting, but I think it made for some pretty wacky dreams overnight. I dreamed I was dangling precariously from a trapeze. It felt freeing and dangerous at the same time, and I was doing it at a department store. What the dream meant I have no clue.. what kind of metaphor is that? I used to think I had a high threshhold for pain, given my years of back problems. I think I was wrong. Case in point, getting my ironman tattoo hurt like hell. Kelly, who got one at the same time, didn't feel it as much as I did. Then I hate needles. It hurt when I got stuck at the hospital. Now to my "new and improved" back. I am still feeling a great deal of pain if I don't take the vicoden. I take two every 4 to 6 hours. I tried taking just one this mornng, but it didn't help. And when I wake up, my back hurts like crazy. So if I really had a high threshhold for pain, don't you think I would not need so much pain medication at this point? Trust me, if I could, I would get off the meds entirely! I have to share these photos. My dogs have no idea what to do now that I am home all the time! . . Ally basically plops onto the couch and snores away. I now she looks depressed, but she really looks like this all the time. . .
We recently adopted Tommy from my parents, who couldn't take care of him anymore. He has been a really sweet dog and is actually a better guard dog than ally (he barks at everything). I love that he camouflages when on the couch!. A Sixth Sense . . It's hardly believable to me that it has been SIX days since my surgery. There was so much anticipation on my part for this major procedure, and now it's over and the recovery process is in progress! I am very blessed to have wonderful friends. In my house sits five incredible arrangements, lots of cards and well wishes, and I've had many wonderful visits. . . It's really nice to know people care. Now, I did receive two dozen red roses today, addressed from the Methodist Hospital. Am I to assume the hospital sent them, or some unknown person? Maybe the hospital was sending flowers because of the meltdown incident? I had a few people, including the nurse director, come visit me and ask me what had happened. Was this its way of saying sorry? Anyhoo, they look and smell great. I had a not so good night last night. Before I went to bed, I accidentally took two of my muscle relaxers instead of one, so I skipped the vicoden thinking the extra dose of musle relaxer would knock me out. I woke up around midnight in seething pain. My legs start feeling sharp shooting pains and my lower back starts plain hurting. The vicoden have been a lifesaver, and I pretty much take them every four hours, except for when I head to bed. So instead of bearing the pain, I popped two pills and went back to sleep. Only I kept on waking up through the night. I was sweating and having the strangest dreams all night. At one point I was trying to get to the beach because it was my turn to watch the shetland pony? I did get a my little pony toy as part of my happy meal package the other day... I wonder if that had anything to do with it? I woke up pretty groggy this morning, but once I was up and around I started feeling great. Of course, that's with the help of pain pills and mobility. Rob and I took a walk around the neighborhood, and I walked a whole two blocks! That's major for me. I went from shuffling to walking relatively normally, although with tightness. So I am better, but of course in the back of my mind I have some fear that the pain, and these little sharp shooting pains, won't go away. Of course they will, right? I mean, it has only been six days? I just hate that right around the fourth hour, the pain creeps back, and I am forced to take 2 more pain pills. Two pills are all I need, but I need them. I take about 10 pills a day, and three muscle relaxer pills a day. I was hoping to wean by now, but I simply can't. The pain has not subsided and worsens at night, although my mobility is better. I have been doing a lot of organizing around the house. I cleaned out a few kitchen drawers, organized some drawers for office supplies and threw out a bunch of junk. It's amazing to me how much crap piles up in drawers when you neglect them. I'm also back to obsessively cleaning. I have been keeping up with the kitchen and bathroom. Maybe I am overdoing it. I do a lot of kneeling, but I am careful to not bend my back. Laying around drives me crazy, but I know, I need to be careful. I just hate seeing a messy, cluttered home. Maybe tomorrow I'll just rest and catch up on Grey's Anatomy or Ugly Betty. I have not watched one episode this year, but did TIVO them. Firstly, forgive me for my many grammatical errors and missed words in my last post. Being on 2o grams of Vicoden every 4 to 6 makes me pretty loopy. Hopefully as my pain subsides, so will my use of these lifesavers. Seems like I'm taking them like candy right now, but such is the purpose. Seriously, without pain meds, I cant imagine how one possibly survives a slice and dice surgery like mine. Since this was my first ever surgery, I guess I didn't know what to expect. I didn't know that pain pills only take the pain edge off, that there is still soreness and that dull pain down your legs and that the pain feels familiar if not worse than the pain I felt before surgery. How can I describe it? Well, imagine someone taking your entire lower back and squeezing every bone and muscle as hard as they can and never letting go. The imagine that with every movement, whether it be bending or getting into a different position, that squeeze is excacerbated by a tentacles of pain shooting down both legs. Welcome to my recovery. Notwithstanding, I do feel improvement and can sort of, in a strange way, see that proverbial light at the end of the tunnel. Maybe this is in my head, but the pain I used to endured by my fractured vertebrate, bad disc and slipped disc is soreness is following my surgery...this I am hopeful. I couldn't imagine living with this indefinitely. Last night, and I don't know what I was thinking, I decided to take Rob up on his offer and head to our local sushi restaurant. Major mistake. I still cant comfortably sit, so I twisted and turned the entire time. There is a reason the doctor orders bed rest for two weeks. I learned that the hard way last night. I have received countless well wishes from friends, many of whom are like family to me. One of whom paid me a surprise visit last night. Ironbabe Jane, fresh from her first Ironman finish, came into town. It was so nice to see her, kinda like comfort food. Oh and earlier that day BFF Ryan and cuteface Andy came over. Ironically, Ironman Hawaii was on TV. Jane also got inked, albeit considerably smaller than mine. Which leads me to my hope and determination to be back on training and on track for another Ironman finish. Doc is saying 6 months before running, and before that, just walking and light weights, swimming, stationary cycling, etc. It 's encouraging to me that he was confident the surgery went well, and I should be able to do the things I want to do in a year or so. I may or may not be blogging more in the days to come, since I am homebound. I have a huge mound of magazines to thumb through, but thankfully my first semester of school and my internship have ended (more about this later). I know, I haven't blogged in a million years. But the last three days of my life are definitely blogworthy and something I'd like to reflect . Because Tuesday evening was one of the most significant things of my life. Definitely a top-tenner. I finally had my back surgery. So kinda like a race report, this will be a blog chronicles how I got here, my thoughts on the surgery, my meltdown, and finally, my release. WOO HOO! I was only hospitalized for three nights! So ten years ago, while living in Saipan, I was out waterskiing. Only the driver of the boat took a hard right to avoid a wave, making my flex and crunch my L4, which is the one of the lower back vertebrates. The first several months following that accident were horrible. Sharp shooting pains, an inability to workout, etc. But eventually, through much physical therapy, I got through that and was able to resume running, which at that time was my only physical passion. Through the years, I simply sucked it up. Some days were better than other, and I tried just about every therapy out there. While they helped releived the pain, it always came back. And I refused surgery, since it was manageable. Fast forward to 2005. I think I was running my fifth marathon and simply couldn't do it anymore. I was taking tylenol like candy and the pain was unbearable at time. So that year I commited to diversifying my workouts by taking up triathlons. The irony. Of course I got bit by the ironman bug. So how did I manage the pain for the last few years? I discovered cortizone injections and vicoden. Now people give V a bad rap, but it's a godsend. Vioxx was too, but of course that was taken off the market. This past year, things got as worse as they had been. 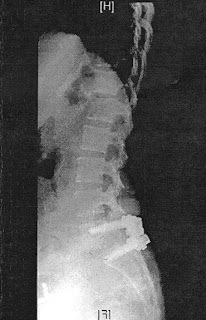 My vertebrate now revealed fracture lines on both sides, slippage between my L4 and L5, and my L5 disc was deteriorating. Simply put, my body took a pounding from doing triathlons. But it sure was worth it. I also commited, or my doctor commited for me, to stop getting injections. He didn't like the V idea either, to which I concur. Best take care of this problem by no longer band aiding it, but to consider an alternative. As fate would have it, my neighbor and I happened to be speaking as I ran by her house. She has also finished an ironman. I told her how bad my back had gotten, to which she beckoned her husband to come outside. Turns out, he's a neurosurgeon who has performed thousands of surgeries and is considered among the top doctors in fixing bad back. Four or so months after that fateful meeting, here I am getting wheeled into my first ever surgery. And it was a serious one. Pardon me for my plain spoken language when it comes to what my doctor did, but it's easier to explain it this way. 3) allign the slippage area and insert rods, forming a cage like concoction. And of course I was nervous. But I want to live my life to the fullest, I want to keep training, doing races and eventually, my lower back area would get to the point I'd have to have surgery anyhow, so why wait. And trust me, I really have tried just about every form of alternative treatment out there. There's not a whole lot doctors can do with a bad disk, fractured bones and slippage. Medication may quell the pain, but that was it. The surgery, according to my doctor, lasted four hours. He told me was a perfectionist and wanted to do it right. That was comforting to know. I mean, he is my neighbor... he wouldnt want me to walk by giving him the finger or something. I was pretty woozy when I came to, a bit sore in the lower back area, but i was good. The first night was pretty tought, since I was still tender and couldn't get comfortable. With the help of a morphine drip , I was on my way to recovery. The next day was an entirely different story. That morning I took my first steps. I told the doctor I was feeling good. So we decided to get me off the morphine drip and switch to vicoden. Then it was suggested I remove my catheter and start urinating on my own. Major rookie mistakes on my part. By early afternoon, I couldnt pee. I would sit on the toilet for what seemed like forever. Then I was starting to feel more pain and it didn't register to me i needed more medication. Or maybe i wasn't vocal enough. Or maybe my nurse that day was an inexperienced BEE-OTCH. Anyways, by that evening, I had a bladder full of pee, I was miserable and I couldn't even move or get out of the bed. I was in so much pain that by 8:30 that even, I started bawling and getting scared. Thankfully Rob called my doctor and I was back on the morphine, not to mention my catheter was reinserted. They say that it takes 6-8 hours before one can pee again after removing that darn bad, but I guess the nurse figured I would hold it and take it. Anyhoo, it was a bad few hours. Once the morphine kicked in I was much better. It just wasn't fun. The following day, I got a new nurse. The doctor wouldn't allow me to leave if I was going to stay on morphine, so I took a chance and went to the vicoden instead. Only this time he doubled up my intake. I was taking pills every four hours and by last night, I managed to pee on my own again. So this morning, much to my excitement. I checked out. I'm very grateful to my doctor and the great nurses who nursed me back from my meltdown. Im grateful to those who stopped by to visit, and I will forever be grateful to Rob, who served as not just my partner, but my advocate through this process. He was there the entire time and hardly left my site. It's been less than 72 hours since my surgery. I am home, medicated, but I am walking around and ready for a speedy recovery. I'm amazed at my progress, from barely walking to now walking quite a bit. That's not to say I don't feel pain. I do. But it's under control. I am homebound for the next two weeks, and I am not allowed to drive or do anything strenuous. I am relegated to just walking, but it's okay. I'd rather be sacrificing this time healing than in the condition I was previously in, and that's slowly deteriorating. I think this is the longest blog I have written, but I wanted to chronicle my thoughts. Cheers and happy training...or recovery on my part! "Healing takes courage, and we all have courage, even if we have to dig a little to find it." So yesterday I rode 25 and ran 10. Not long ago...mmmm.... like last year, that would have seemed like no big deal.... yesterday it felt like HELL. Save for the weather, I was totally spent. I was slow as a caterpillar, and my back was SCREAMING in pain. Which begs the question: WHAT THE HELL AM I DOING? 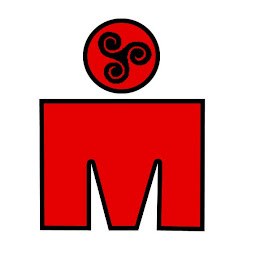 Am I crazy to want to do a half ironman in two weeks given my back is killing me and i'm seven weeks away from MAJOR back surgery? maybe, but here's my reasoning... . . . . . . . Since I will be out of commission for at least six months, I want to do ONE more, just in case. I mean, what if the surgery doesn't go well and i cant run anymore after this, much less do triathlons? I will be triathlon deprived, training deprived and sulking in non multisport misery. . . . . One last hurrah won't hurt...that bad...will it??? . . . . . Cheers and happy training! . . . . "Keep away from people who try to belittle your ambitions. Small people always do that, but the really great make you feel that you too, can become great. Howdy and thanks for checking out my blog! 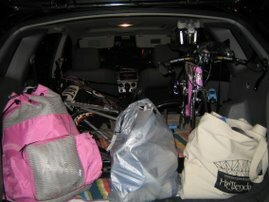 I started blogging to share my triathlon misadventures. Then in 2007, I finished my first Ironman. These days I am on the road to recovery from back surgery, settled down and looking forward to a great 2009! Cheers and happy training! I"m officially marked with the M dot! This is how big my tat is on my ankle! momo - and another pink guru sister! Ally...I kiss her on the black lips!